It’s been a good nine months for Leicester City Football Club. So good that on Monday the team overcame 5,000-to-1 preseason odds to clinch the Premier League title — its first. Forbes reports that the title is worth more than $100 million to the club, and it’s been nothing short of magic for the club’s fans in that otherwise “unglamorous city” in the Midlands of England. Champions tend to come from the top of the previous year’s table. Until this season, every team that has won the title in the Premier League era (which began with the 1992-93 season) finished no worse than third in the Premier League the year before. Of the 70 top-tier league championships since World War II, only six were won by teams that did not finish in the top half of the division the year before. Three times, teams promoted from the second tier went on to win the top tier the next season (Tottenham in 1951, Ipswich in 1962 and Nottingham Forest in 1978). And three winners had finished in the bottom half the year before — Arsenal were 12th in 1969-70 and 13th in 1946-47, and Manchester City finished 15th in 1966-67. Last year, Leicester finished 14th out of 20. They averaged just 1.08 points per game (a win is three, a draw one, a loss zero) and were in last place as late as April. Coming into this season, there was no indication of a turnaround, and most predicted that Leicester would be relegated — demoted to the second tier of the English system. Team manager Nigel Pearson had just been fired, and the club had lost its best midfielder, Esteban Cambiasso. The likable Claudio Ranieri took charge, but he had never won a league title before, and his most recent job was a disastrous spell in charge of the Greek national team, overseeing the squad’s embarrassing losses to the Faroe Islands. Leicester had no marquee stars. The Leicester team was a blend of aging players who had spent most of their careers in the lower leagues and overseas players from lower-level foreign leagues. Famously, its leading scorer and this year’s Football Writers’ Player of the Year, Jamie Vardy, was playing non-league football just four years ago. Even family members of current Leicester players claimed greater success than the whole team. Peter Schmeichel, the father of Leicester goalie Kasper Schmeichel, had more Premier League hardware (five titles) than the entire squad combined (31-year-old Robert Huth and 43-year-old backup goalie Mark Schwarzer both won with Chelsea in minor playing roles). 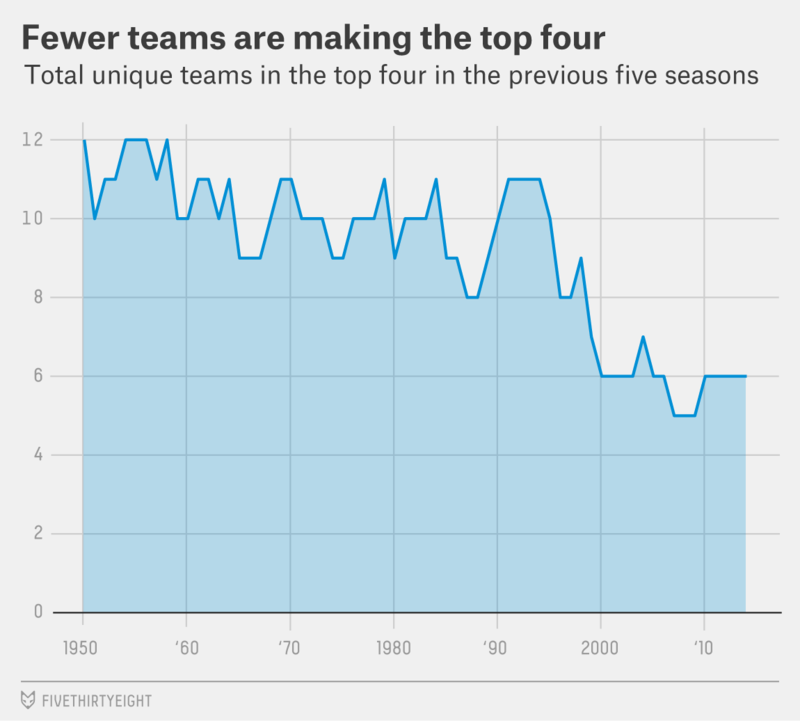 But this amazing change in fortune really began years earlier, in the 2008-09 season, when Leicester were dwelling in the lower, far less glamorous third tier of the English football pyramid, known as League One. Since World War II, only one team — Ipswich Town, the 1962 top-flight champs — has had such a long climb over seven years to win the league title. And no team aside from Ipswich then and Leicester now has climbed two tiers so quickly before winning the title. In the chart below are the seven-year histories leading up to every top-flight English football championship since World War II. Only eight times from 1950 through 1980, and only twice from 1981 through 1995, had a team risen from a lower tier in the seven years before to claim the title. 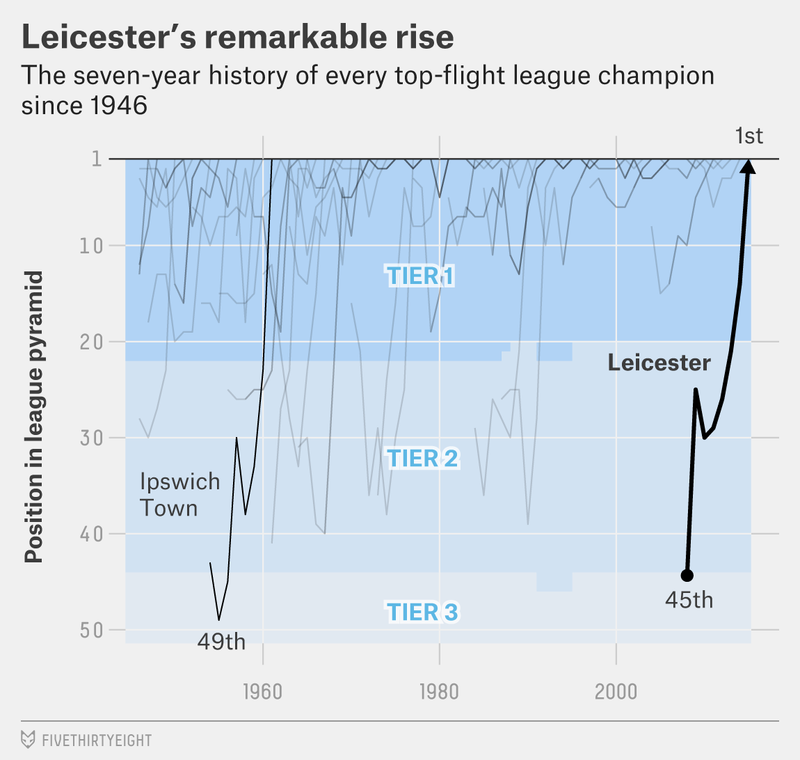 But Leicester’s rise is especially remarkable in the modern Premier League era. A deluge of money into the league has led to increasing inequality and stratification among teams with cash to burn and those without, which makes a rise of this sort into a billion-dollar-Powerball, Donald Trump-is-the-GOP-nominee-level outlier. Even still, Leicester’s wage bill this season was relatively low. The club spent only 48.2 million pounds on wages, fourth-least in the Premier League. Manchester United has spent more money on new players in the last two years than Leicester has spent in the 132 years it’s existed. Leicester’s title is being trumpeted as “the most unlikely feat in sport history.” Unlikely? Absolutely. Leicester’s rise has been exceptional, no question, and all the more impressive in a climate where dollars, like heat, tend to rise to the top of the table. But unprecedented? No. English football, with its meritocratic system of promotion and relegation, at least makes Cinderella runs like Leicester’s possible — but there hadn’t been a ball in quite some time. This year’s runner-up hasn’t been determined. The charts, and many of the figures, in this story are based on a historical soccer data set compiled by one of this article’s authors (James), which can be found here. Three teams — Spurs in 1951, Ipswich Town in 1962 and Nottingham Forest in 1978 — won the league after being promoted from the lower tier the year before. Points in this analysis are calculated with a win worth three points and a draw one point, the system introduced in the 1981-82 season.